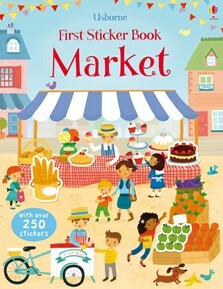 There are over 250 stickers to bring the hustle and bustle of the markets to life in this vibrant sticker book. Includes lots of busy market scenes with plenty for children to spot and talk about, including a Farmers’ market, a Flower market and a festive German Christmas market. From toys to hats, freshly baked bread to bunches of flowers, there’s something for everyone at the market!